Maiev Fenrir’s Screenshot Adventure – June 2004! June was a big exp month for Maiev, where I spent most of my time exping in Boyahda Tree. 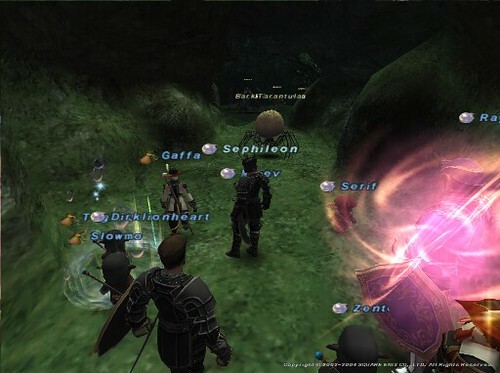 One thing I remember was, how a summoner Esteraza tried to get exp party. In her search comment, there was always a line “With Light Staff and will heal” haha! That always made me laugh, but was one of the most smartest thing to do, since most people realize later that summoner was quite hard to exp, especially in an experience party situation. But lets start with some SS! Of course, I was already part of this awesome static :D with Powerz and Inwglhero, Krelian, Toomuch, Jazzel, Special, Serif and Ciermel :D! Then there’s the most LOL Epic Drama :D! The first MONK AF2 Dropped, and Zimph decided to bribe um…McDanks to pass his AF2 and pay him 1m LOLz. Zimph haven’t lotted so not like he lost the lot then bribe. But that was one LOL Drama! There’s 13 pages of it :D! Click the image below, and press “Newer” for next page! Considering the only AF dropped that night was MNK, it was a hot topic. After that dropped, we just kept wiping and it ended up like this LOLz. Maiev joined TLW (The Light Warriors), a HNM Linkshell of Fenrir back in 2004. The leader was Katrinka and Dirklionheart! Dirk was one um… hilarious and not the brightest person but, then nobody knew how to run a proper guild/linkshell back then so Kudos for being the first and trying. My opinion was he lacked administrative skills but oh well! Since gear wasn’t top notch back then, we had to use Summoner’s AoE blink on the PLD to help get a few hits out of the way. AoE Stoneskin as well :O! We have to have 2 PLD to take turns tanking and Provoking it off each other so blink would be up by then. We also had to setup SKILLCHAIN (WHOA! 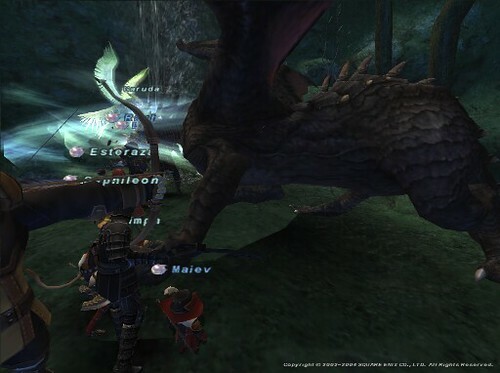 ), Yes, back then, HNM requires skillchain and mages magic burst to kill it. I really have to say I enjoy the old days :x it required a lot more skills than today’s Abyssea and post ToAU gear / merits. Bard and RDM for maximum MP regen. The fight would be a lot more difficult if it was a Nidhogg. Here’s a few screenshot of these EPIC Fafnir HNM back in 2004 June! From camping to actually fighting, to even taking a GROUP picture, because we felt SO accomplished killnig this “HNM” :D! Killing Fafnir :O! AoE Stoneskin, Blink, keeping Stoneskin up after each AoE attack from Fafnir. Group picture after Maiev’s and TheLightWarriors (TLW)’s first Fafnir kill! :O Yes, we felt quite accomplished. It was also the first month where Maiev saw the world of Tu’Lia, one of the most beautiful place in FFXI :O IMO! :O! It was like a fantasy land ;D! I met a few more awesome people! Maboroshi, Indain (really good WHM), Ciermel (also very good WHM! ), Serif, Zamaye, Lonna, Ankiseth, Gaffa, Esteraza, Kirschy, Zimph (lol), Gaffa, Meikam, Esteraza, Kirschy, Gaffa, Alchemar (I was so jealous back then at his Vermillion Cloak, looked so cute), Relm, Cow, Killacolt (and jealous at his Dalmatica), Pdan, Rayho, Sephileon, Liquido, Jonpaule, Slowmo and my best friend Takalo! 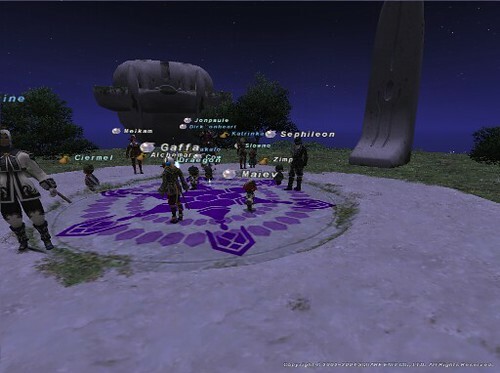 This marked one of the most awesome month of my FFXI Adventure :D!